This entry was posted on April 21, 2017 by Y Hasegawa. Could a Futon Be the Solution to Your Back Pain? Futon for back pain relief? When we first created FutonBedsFromJapan.com nearly 2 and a half years ago, I had been sleeping on a futon for over 7 years and loved it. At that time I just thought authentic Japanese futon were awesome beds . . . though I hadn't really thought too much about the "whys" of it all. It wasn't until after I started to interacting with my fantastic customers that I really began to comprehend all of the associated health benefits of our amazing product. I had figured that people would be interested in a more natural bedding solution, and also the convenience of traditional futon, but it turned out to be much more than that. My original website video basically focuses on the drastic differences between authentic Japanese futon and what we call "Franken-futon"— the so-called "futon" that are foam-filled and also made with other synthetic materials that are manufactured and sold in the West. However, it quickly became obvious that there was a lot of interest from people who were suffering from back pain due to the lack of back support from Western style beds. Often we would get emails from people who had given up on beds altogether and had opted for sleeping directly on the floor as it was the only way they could get any relief from back pain and finally get a night of real sleep. Honestly we were very surprised—but certainly shouldn't have been. Could an authentic Japanese futon be a solution to your Back Pain? "The best night's sleep I've had in 20 years!" That may sound like sales "hype" to you—it would to me too, except that is the type of comments we've received from customers who had been plagued with back pain for years. ... I've been using the futon I bought for a month and it is wonderful. I'm more rested on fewer hours of sleep and I don't have the back pains I got from my old mattress. I've recommended one to my friends who also have back trouble. ... the first thing I noticed was I felt like it was holding my lower back in place. where as a spring mattress would let me sink in and curve so to prevent lower back pain you'd do something like prop your feet up or have your knees bent. The shikibuton felt like I was laying on a lumbar support chair or something. I took just a nap on it shortly after I got it and woke up and glared at the spring mattress we still have till I can order a full size [futon] for the bedroom replacement. ... the shikibuton I ordered is saving my back from a spring-mattress-hell. I was almost giddy when I woke up and didn't feel any pain, ... I've slept on it several nights and it's just as good every time and ... Matter of fact I find myself sleeping in positions I normally never would (flat on my back for instance) just because they are now comfortable to lie in ... I can already feel how much better I'm sleeping I still wake up for bathroom trips but other than that It's like night and day. I find myself waking up to roll over maybe once. We had.... the most wonderful sleep of our lives! I have to admit, when I first set my eyes on the futon, my first thought has been "what have I done, this is too thin to possibly be comfortable". I've been having back issues for many years now, and although I stay fit and workout a lot, nights always tend to be a bit of a "sufferfest" ! To cut a long story short, I slept like I haven't done in years and this morning my back is totally pain-free for the first time in ages! Once I opened up my futon I was immediately delighted. The craftsmanship and pattern was just beautiful! ..., the futon was very comfortable and I had a great first experience with my futon! It is much different from the thick soft bed I used for about 10 years, but my back feels great and I slept like a brick! Overall I am extremely satisfied with my futon ... Thank you! Emily says that it feels just like the futons in Japan. Every morning when she wakes up she tells me about her lack of back pain. We bought this shikubuton as an extra bed and was hoping it would be as wonderful as the ones we slept on when we visited Japan. It arrived after only a few weeks. The quality is amazing! I actually hate to cover it with the mattress cover because it is so beautiful. I slept on it last night for the first time and placed it on our hard wood floors. I love the firm comfort of sleeping on this shikubton as soft mattresses bother my back. Thank you for an excellent and beautiful product. 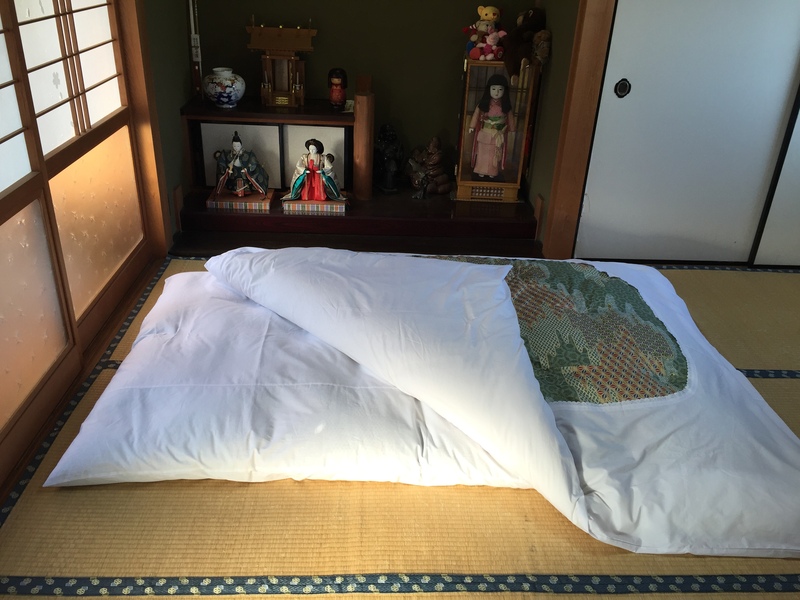 I took 2 weeks before eventually writing this testimonial as I wanted to see how well I could sleep on my new Shikibuton apart from it's beautiful appearance and apparent quality. And I have to say I am more than happy with my purchase! Even though I place the Futon directly on my wooden floor it gives just the right kind of support and heat. I think it's safe to say that I've never had better sleep and my hips and back don't hurt after getting up in the morning anymore. Also, I would like to explicitly thank you for making such a fast delivery possible.. I did not expect anything like that and your customer service is fantastic. I loved learning about the manufacturing process and the unique craftsmanship of the Japanese Masters! It's been an exciting and rewarding journey and I will recommend your Futons to anybody interested. We certainly could go on with many more testimonials, but we think you get the idea. Our authentic Japanese futon can be a great solution for back pain because they provide excellent comfort while at the same time providing the support. Also, unlike Western style beds that can start out fine but eventually begin to sag and no longer provide the support your back needs, our authentic futon will never have that problem. If you would like to learn more about our authentic Japanese futon you can visit our Futon Guide Video Page and also place your order online on our Futon Product Page.